There are few places on the planet better suited for a big underdog moment than Philadelphia’s Benjamin Franklin Parkway, which includes—among its many other features—the “Rocky steps” that Sylvester Stallone jogged his way up in his beloved 1976 Oscar-winner. Still, it’s not every day that the “underdog” in question turns out to be the city of Philadelphia itself, which suddenly finds itself feuding with JAY-Z, one of the biggest and most powerful celebrities in the world. Per Variety, the conflict comes down to arguments about where the city will allow JAY and his fellow festival planners to hold next year’s Made In America Fest, which has been traditionally held on the Parkway ever since 2012. Indeed, that’s where it’s scheduled to be held this September, but, according to the city’s mayor’s office, that’ll be its last time in the locale. Citing increasing costs and effects on tourism in the area, the city made what appears to be a unilateral decision about the festival’s occupancy of the site recently, telling local news that Made In America would have to find a different home in 2019. 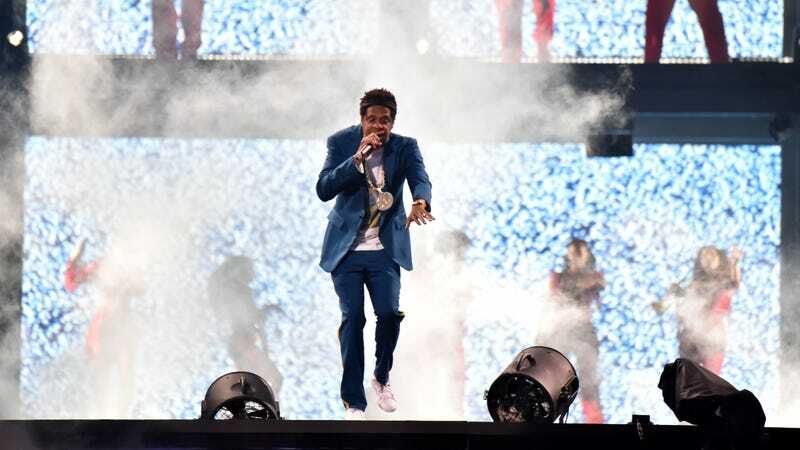 JAY-Z and Beyoncé are both scheduled to come through Philadelphia later this month as part of their dual On The Run II tour; they’re expected to have a sit-down with city officials at that time in the hopes of working the conflict out. Philadelphia mayor Jim Kenney will presumably spend the intervening weeks training vigorously for the encounter, pulling old farm equipment, smacking meat, and arguing with his brother-in-law’s stupid robot to get himself into shape.